A page from the forthcoming Concordance at the Kelsey St.
"What if that image were Eros as words?" "Between its alleged color and its alleged visibility is a lining, like the double of a mouse, latency, flesh." shadows fell like hinges on erasures. itself before, as if all shots were mobility frames. Small daisies grow in the cut, preserving the shape. as limit, like the surface and mass of a lake. Nothing was completed, but there are a lot of sketches." "That particular conjunction of events which includes the history of your body, your experience, and your art vertically, and the time and circumstances you are in horizontally, seeks an expression, that is inevitably unique, or new. A formal problem or limit represents a limit of what you can make or say or see, at a particular moment. You might make a new form by following a desire or an intuition into a further, more contemporary part of you, such as varying the line length according to the horizon, embedding scientific terms into an equivocal or into a lyric context, using thought imagistically. I find the idea of newness interesting, during a time when there is no recognized critical aesthetic. The criticism is at the edge of what it can discern or say, and so it's interesting to seek emerging form in fashion, in the margins of the arts, on the street, in experimental physics." "Here "around her" may be within her, or perhaps the suggestion is that all outside space is "intercapillary," between the bodies' organs, and relates to them--what an extraordinary definition of space as social!" "Instead she's using a variety of connections and contexts that themselves attach to different points on each sentence, and the spaces between the sentences make all this evident, visible. Like an appliance that can connect with different cords to different outlets." "If the world is flames, and you are flames too, then you don't see the flames. when the spray of yellow leaves moves." So that the place would sit in me, its wide space with sun, as what it would be in my memory of this time. And how it would be perceived is a matrix of how you were with some people around you, not agents but catalyst or fuel for the perception of light on a wide space, so free as to be impersonal in the company, implacable and impersonal." "The way in which she shares her happiness, as a matter of course, gives me a sense of guilt, because I do not feel the happiness. The white of an eye is scratched away." 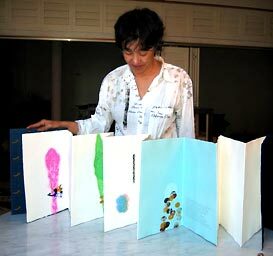 Three conversations with Mei-Mei Berssenbrugge at Jacket - with lots of photos of her book-collaborations with Kiki Smith and with Richard Tuttle. "MB: New Mexico has been important to my work for a long time, since my early 20’s. It helped me to think about the horizontal plane of meaning, because its landscape is so large. Also, it correlated with my interest in phenomena around me, because the light is always changing and you never get used to it. It’s beautiful and spiritual." "John Ashbery is a great influence on me because of the fabulous richness of his metaphoric and linguistic abilities. Specifically, I thought he could make a kind of simultaneity in his work that interested me. At the end of a poem, it can all rise up to be one time. You can see it as a simultaneous time. For me that opens up all kinds of possibilities of navigating your way in the world, and also the kinds of things you might include in a poem. I like Ezra Pound's language and straightforwardness, and also the complexity of structure in his Cantos." Two readings and a conversation with Charles Bernstein online at PENNsound. What is a "phase-shift poetics"?